John Cullen emigrated with his family from Killinkere, Co. Cavan to Bytown, Upper Canada in 1826. He and his eldest son Anthony worked on the construction of the Rideau Canal and c1829 settled in Templeton Township, Lower Canada as one of its early pioneers. By the mid 1850s, John and his family had become important farmers and squared timber operators in the Township and were leaders in church and community affairs. 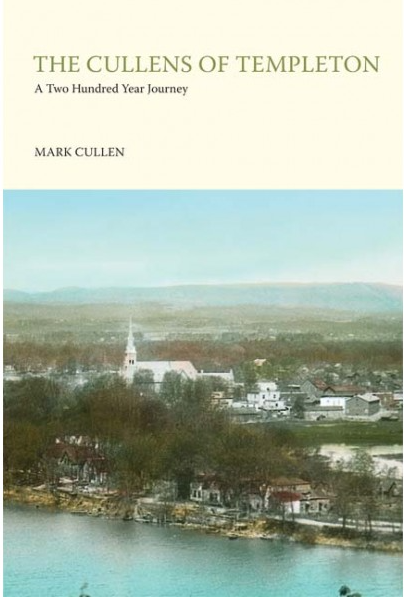 A complete biography is featured at www.cullenancestry.ca (Feature Story 1) and his biography and those of his descendants are the subject of the book "The Cullens of Templeton, A Two Hundred Year Journey". This was the first church in the parish, erected c1840. John Cullen and three other colonists were instrumental in promoting a new Catholic parish in Templeton Township. The location is Blvd. St. René at Rue Cheval Blanc in Gatineau, Quebec. the trees have been replaced by a housing subdivision. Excerpt from Point Fortune merchant John Macdonell's 1828 journal. It seems that John Cullen guaranteed purchases of two individuals, probably his workers. There are 3 signatures, the first two are likely made by clerks and the third is believed to be John Cullen's signature. [S57] Ancestry.ca Drouin Collection, St. Francois de Sales, Pointe-Gatineau.